Little piglets to carry around with you at Japonica. You can also rez them, they will stay 1 LI to a bit bigger than they come. Each piglet is texture change on touch, and can be a pink piggie, a heart spotted piggie, or a stripey baby wild boar. 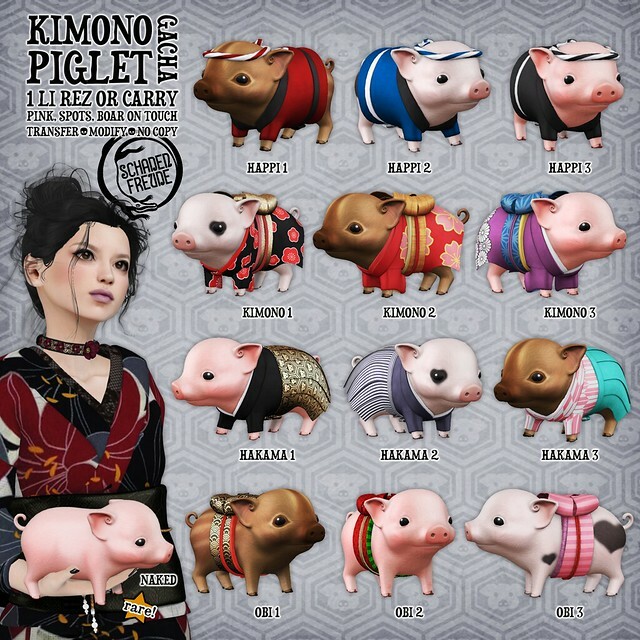 The piglets in the happi coats have a tomoe symbol on the back (triple swirling comma shape), which can be changed to a crest you create and upload if you desire (templates for download and scripted to change by UUID in the menu, so you don't have to worry about retexturing the wrong bit). Japonica is open until January 14 at 8am SLT.